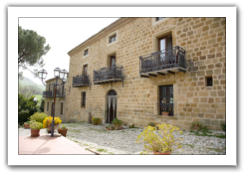 We invite you to spend a Madonie, the center of Sicily, where you will discover a land still rich in history and tradition. Enchanting walks await you and many opportunities for recreation and fun. For art lovers, the villages and their churches will become a treasure chest full of treasures. For sports enthusiasts there is the Adventure Park Madonie to offer opportunities for fun. For lovers of fine cuisine then there will be lots of good food to enhance a holiday, we are sure, will be unforgettable. Restaurant, Bar, Garden, Terrace, Non-Smoking Rooms, Check-In/Check-Out Express, Heating, Luggage Storage. My husband and I stayed one night at Villa Raino farm in mid-May of 2008 and we have found an attractive property in a "campaign" bucolic environment. The gardens were beautiful, green and covered with wildflowers is called. The villa was once the country retreat an18c for a wealthy family in Palermo. The current owner, Aldo Conte, renovated at present and open to guests in 1996. All the family help in the work function, which creates a friendly atmosphere for guests. The interior of styles and periods rented bicycle is typically Sicilian.